Welcome to Paper Parfait. Our invitation studio specializes in creative and fashionable invitations for all occasions as well as accessories and custom party favors for your event. We can't wait to work with you and no matter what your needs are, we are here to help! Please contact Denise Abramson, Owner, at denisersvp@aol.com; or Samantha Jacob, NYC Sales Director at samanthajac@gmail.com to set up an appointment. Children's Stationary, Gift Tags, Stickers and more! denise founded paper parfait invitations over 30 years ago, beginning her business by posting her services on boards in local nj maternity clothing shops. after a short while, her business took off, and she has been serving her community with the most exceptional of all things invitation, party favors and more ever since. 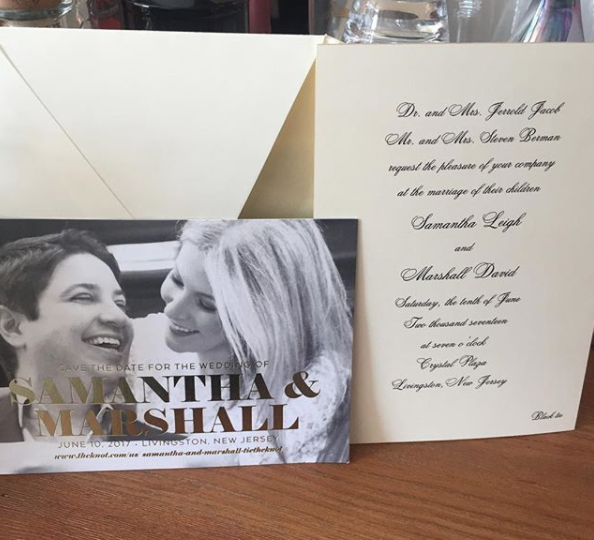 Samantha began working with Denise (as Denise's Manhattan Local sales representative) as she was planning her own wedding, though her family has worked with denise for almost as long as paper parfait has been in business - since the 1980s. if you are in manhattan or greater nyc, sam’s your point person, and will make you feel right at home as you plan your events together! she speaks from experience that working with planning teams that care about your needs as though they are their own makes us stand out! she takes appointments in her ues home office for those who are nearby, as well as by video conference for those who are out of the immediate area. Contact Samantha via email, at samanthajac@gmail.com, by phone at (973)-568-0640 and via social media including facebook (@samantha berman) & Instagram (@samalamaberman) where her work can be showcased. Melissa Trachtman has been a creative designer at Paper Parfait for over a decade. Melissa is a graduate of the University of Michigan with stops along the way at Donna Karan and Nicole Fahri. Melissa has a unique way of listening to her clients and then using her creative vision to develop one of kind creations with the ability to work within any budget. Her creations can be found on Facebook or on Instagram @ melissatrachtman and can be reached at melissatrachtman@yahoo.com or 973-464-1453.